Since this was originally posted, separate discrepancies on the Microsoft site have been updated to reflect the true date. In fact, the SCCM 2007 lifecycle table has been updated to reflect that, not just R3, but mainstream support for ALL ConfigMgr 2007 versions will expire on July 8, 2014, with extended support ending on July 9, 2019. System Center Configuration Manager 2007 Service Pack 1 5/21/2008 Review Note Review Note 1/11/2011 Support ends 12 months after the next service pack releases or at the end of the product’s support lifecycle, whichever comes first. For more information, please see the service pack policy athttp://support.microsoft.com/lifecycle/#ServicePackSupport. 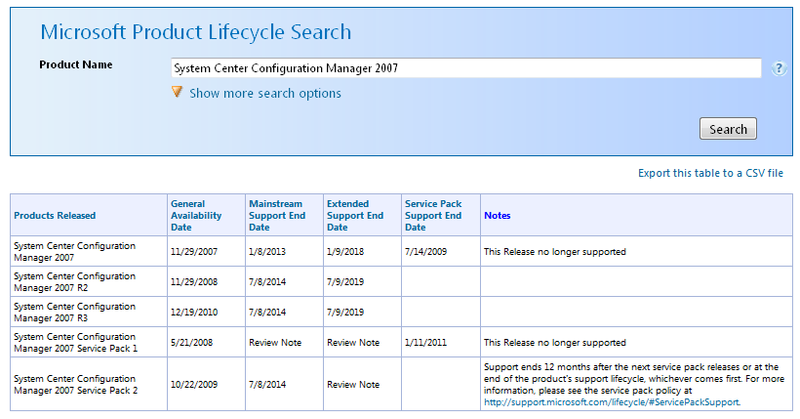 System Center Configuration Manager 2007 Service Pack 2 10/22/2009 7/8/2014 Review Note Support ends 12 months after the next service pack releases or at the end of the product’s support lifecycle, whichever comes first. For more information, please see the service pack policy athttp://support.microsoft.com/lifecycle/#ServicePackSupport. ConfigMgr 2007 with R3 mainstream support ends on January 8, 2013, with extended support ending on January 9, 2018. What does this mean? It means that you should seriously consider your options when determining how long it will take you to migrate to ConfigMgr 2012. To help keep track of the looming deadline, we’ve added a neat little widget to the all the site’s pages. Here’s what it looks like, but you can find it across all of myITforum.com on the right-hand side of all pages. Are you sure this date is accurate for ConfigMgr 2007 with R3? It states that ConfigMgr 2007 with R3 Mainstream Support ends on 7/8/2014. ConfigMgr 2007 with no service packs ends on 1/8/2013, but this site also says that release is no longer supported. I’d trust the Microsoft Support Lifecycle page over a TechNet article… so I’m going for 8 July 2014. I think the TechNet article (and others) have mistaken the “Mainstream Support End Date” of the original (no Service Pack) version (which does state January 8, 2013) for the “Mainstream Support End Date” of R2/R3/SP2… but the original (no Service Pack) version clearly already says “This Release no longer supported”. Plus I do not see how Microsoft could possibly only give all ConfigMgr customers only approx 8 months to upgrade to ConfigMgr 2012 (from release date of CM2012 to Jan 2013)… another reason why I’m voting for 8th July 2014. July 2014 looks correct… Wally posted below. And the reference to Jan 2013 is gone from below link… it points you to the Support Lifecycle page now.